Fundraising Update! Over £4000 raised for Helping Hand charity! Home / News / Over £4,000 raised for Helping Hand this year! In January we announced that for 2018 our charity would be Helping Hand, charity to the Royal Belfast Hospital for Sick Children. We committed to raising £5,000 across the year through a series of fundraising activities and events. To date, thanks to the efforts of the team and the generous donations received we have now been able to raise over £4,000. We’re so proud to be able to donate this money to such a worthy charity. Particularly as it’s a cause close to the hearts of our team members. Helping Hand charity was established to provide the best equipment and fund research and education. 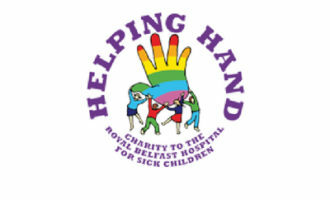 Helping Hand supports the needs of children and their families at the Royal Belfast Hospital for Sick Children in Northern Ireland. By choosing to support Helping Hand in 2018, we want to help fund the purchase of vital equipment. Also, to help diagnose and treat children at the hospital and to support facilities and services for families affected. Our support will also help with funding research into children’s illnesses. So far this year we have organised a tandem skydive which took place in April. This event saw the team from The Home Design Group and fundraisers take to the skies on April 21st. This event allowed us to support Helping Hand, raise awareness of the charity and enjoy an exciting challenge together. To see how the team fared on the day, you can read more here. Keep your eyes peeled for more updates as we work towards our £5,000 fundraising target! Make sure you’re in the know and follow our progress by signing up to our email here. Each month we share news and updates with our readers as well as sales, promotions and customer showcases. Check out our Facebook, Twitter, LinkedIn and Instagram too.